Yesterday’s American announcer kept waxing lyrical about Copenhagen. I seem to recall he trotted out the same fare in Melbourne. Yes, there were more fans at yesterday’s race but Copenhagen is more easily accessible, particularly for the hordes of Scandinavians who started drinking at the start of the race and were still going strong 12 hours later. I’m guessing there’s some sore heads today. The Copenhagen newspapers patted the City on the back for holding the races in the City. I’m sorry but, while the time trials were in the City, the road races were most definitely in the suburbs. That said, the Danes clearly love their cycling and put on a good show but, IMHO, it lacked the pizzazz of Varese, the ambience of Salzburg and the energy of Geelong. I was also horrified, as I walked from the course yesterday, at the amount of rubbish, largely tins, left behind. Methinks the Danes aren’t quite as green as they’d like you to think. I went to wait outside the Press Conference to get Cav’s photo and autograph for my friend Olivier who had said that on no account was I to leave Danish soil without it. Having failed to secure it in Melbourne, now was my big chance but frankly I hesitate to disturb riders after a race. After riding, all I want is a shower and something to eat. Why should they be any different? Thereafter, Ute and I ventured into downtown Copenhagen in search of dinner. We wanted sustenance rather than a gourmet meal and I managed to find a small restaurant which delivered a delicious meal at a reasonable price, no mean feat in pricey Copenhagen. This morning I rose at the crack of dawn to meet my friend Bert from New Zealand who was heading home via London. Needing two more World Championships to achieve his goal of 75 attended, he’s going to next year’s Track World Championships in Melbourne and the Road Race World Championships in Limburg. Which is kinda neat as his first one in 1948 was also in Holland. So, I’ll get to see him for one last time providing his health remains stable. I gave him a book for his ever growing library which is now on display at New Zealand’s national velodrome. As I checked out of the hotel I bumped into another couple who were checking out. It was Mark Cavendish and his girlfriend. This really was my BIG chance and I have finally secured his signature on a copy of the official UCI results page which lists Cav’s palmares. I’m going to have this framed along with one of the photos I took. I’m sure Olivier will be delighted. I should add that they’re a delightful couple. He’s modest, almost shy and she’ll ensure he keeps his feet on the ground and help him deal with the inevitable problems of his ever growing fame. Good luck to them both. I had a late flight back this evening which left me plenty of time to renew my brief acquaintance with Copenhagen. Having already visited most of the City’s major attractions and after taking account of the mild weather, I decided to take a boat trip around the harbour. This gave me a great view of the City as the boat wound its way through the Inner Harbour, along Christianshavn’s canals and around Slotsholmen, the island on which the original town of Havn was established. 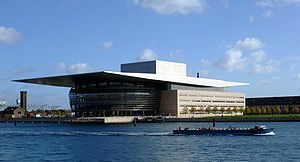 Two relatively recent buildings stood out: the Opera House and The Black Diamond library which houses Europe’s largest collection of book’s published in Denmark. Copenhagen has some very architecturally interesting modern buildings both domestic and commercial. I also had a quick stroll around some of Copenhagen’s design stores, proudly displaying goods by Arne Jacobsen, Georg Jensen, Kaare Klimt and Vipp. I couldn’t resist nipping into a bookstore and buying a couple of cookery books. Having learnt what little Danish I know in a restaurant, I can understand recipes. One place I would have liked to visit is Noma. But, as befits a restaurant twice voted “Best in the World”, the waiting list is longer than the number of yesterday’s spectators. I first saw the restaurant’s young chef, Rene Redzepi, on a cookery programme some years back and thought his philosophy was extremely interesting. I loved the creativity and simplicity of his dishes. 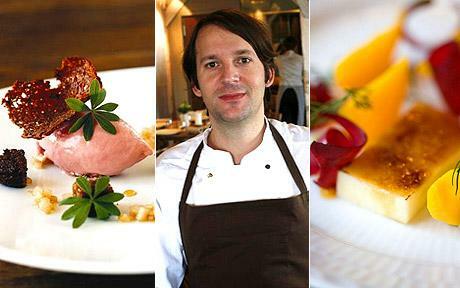 He lives and breathes the mantra of local and seasonal showcasing both unusual and everyday Nordic ingredients. It’s intelligent food served with passion and frankly you’d expect nothing less of a chef with The French Laundry and El Bulli on his palmares. For now, I’ll have to content myself with his cookery book. The airport shuttle bus driver, as I was his only passenger, asked me how I’d enjoyed Copenhagen. In truth I said I’d had a lovely time, and I had, but was ready to go home to France. We then discussed some of the other places we’d both visited and he asked me which was my favourite country? You know the answer to that question: it’s France. Yes, it’s nice to travel, even nicer to travel and watch cycling, but it’s great to be back home. Tuesday postscript: Today, L’Equipe wondered why Cav hadn’t tweeted about his sore head, like Wiggins and Millar, after Sunday GB team night’s celebrations. We know why, but they don’t. And I thought L’Equipe had the inside track on all matters cycling.